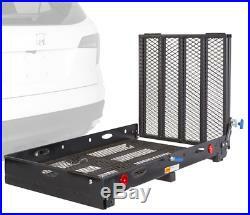 XL LOADING RAMP WHEELCHAIR CARRIER:mobility scooter electric trailer hitch SC500. The&###xA0; Prohoists &###xA0; Wheelchair Carrier with Ramp &###xA0;will allow you to safely and easily transport your power wheel chair or mobility scooter. 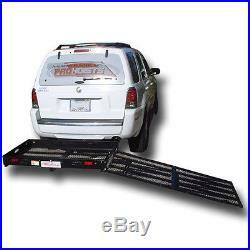 This wheelchair carrier is for cars, SUV, or trucks as long as the automobile meets the minimum height and hitch requirements. The medium wheelchair carrier features a 500lb weight limit and a platform to hold your scooter or wheelchair. 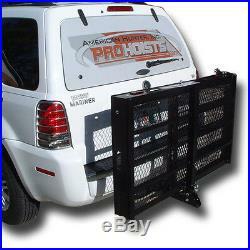 The carrier mounts to your vehicle's hitch. Due to the weight and 500lb weight capacity of this scooter carrier a class III hitch is required. 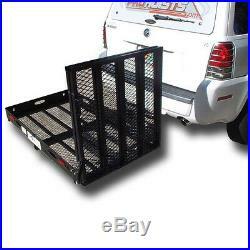 This wheelchair carrier is made of high quality steel that is made to last. The entire carrier is powder coated black to protect against rain, mud, dirt or any other outside elements. When not in use the wheelchair carrier ramp tilts towards the rear of the vehicle to allow easier driving. The attached and included 5ft ramp will allow you to easily load your scooter or wheelchair into the carrier. The ramp is designed to provide a gradual slope when loading a scooter. The loading ramp and platform features a heavy duty steel mesh that keeps the weight of the carrier ramp down and provides a strong and safe support for your wheelchair. This&###xA0; Prohoists &###xA0;wheelchair carrier is designed to allow easy loading and transporting of your wheelchair, scooter or other item. Each carrier includes a extra long 5' ramp when fully extended. It quickly folds and locks for transporting. The ramp will also detach if not needed or for storage. Large hand cut-outs allow easy lifting of the carrier. Each cut-out has a rubber insert for padding. Handles also allow easy controlled lifting of the carrier. Anti-Wobble Device fuses the carrier and the trailer hitch receiver together to reduce movement and prevent trailer hitch receiver damage. Reflectors Included For Your Safety. Inside (usable) platform measurements: 46.5" width X 28" length X 4 high rail. Please note that this item requires a Class III 2 inch hitch. Is a company passionate and dedicated to building long-lasting relationships with fully satisfied, valued customers like you. With over&###xA0; 13 years of experience&###xA0; and knowledge behind us, we are committed to being the very best and continue to serve happy customers in the United Sates and many other countries. We invite you to explore our vast product line and see for yourself. Q:&###xA0; What Time are your Customer Service Hours? This means the lower 48 States only. Q: &###xA0;Can I pick my item up from your facility and what is your address? Q: &###xA0;What is your mailing address? A: &###xA0;Jeffco Distribution, &###xA0; PO BOX 14799, Tallahassee, FL 32317. Q: &###xA0;How do I initiate a return? This form must be on the outside of your return. Q: &###xA0;How long will it take to get my item? Once you&###x2019;re done shopping, the checkout process is easy. It is our choice based on the product size and weight. Not providing this will only cause delays. Tracking numbers and information are provided to you automatically when your item is processed. Depending on your location it will take an estimated 6-10 (or more) days for arrival. You will be responsible for these charges. Please note that the tracking will say Destination Kentucky. This will not stay this way. GSP is not the fastest at updating tracking and we do apologize for this. It is your responsibility as a customer to check the contents of your product upon arrival. Used products WILL NOT be accepted. If necessary, WE shall file a damage claim. ANY ITEM THAT HAS BEEN USED. Hitch adapter and extensions that have been installed. We make no warranties or guarantees, either expressly, or implicit beyond this period unless explicitly stated. All our massage &###xA0;products are intended for experienced adults and bodyworkers&###xA0;18 years of age or older unless specified. Jeffco Distribution will not be held liable under any circumstance for incidental or consequential loss or damage or injury, due directly or indirectly to the use of our product, including any malfunction from negligence or defect. By purchasing this item, you acknowledge that you have read and understood, and you agree, to the terms and conditions of this Agreement, and you represent that you are of legal age (age 18 or older) to enter this Agreement and become bound by its terms. 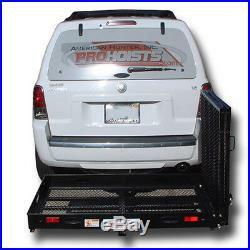 The Prohoists Wheelchair Carrier with Ramp will allow you to safely and easily transport your power wheel chair or mobility scooter. DESCRIPTION: --- This Prohoists wheelchair carrier is designed to allow easy loading and transporting of your wheelchair, scooter or other item. 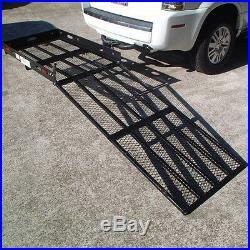 -- Each carrier includes a extra long 5' ramp when fully extended. -- The entire carrier has the option of tilting upward and locking in the upright position for transporting without a load. -- Quick release spring loaded pins allow for easy unlocking of the ramp. -- Large hand cut-outs allow easy lifting of the carrier. -- Handles also allow easy controlled lifting of the carrier. -- Anti-Wobble Device fuses the carrier and the trailer hitch receiver together to reduce movement and prevent trailer hitch receiver damage. -- Reflectors Included For Your Safety. -- Inside (usable) platform measurements: 46.5" width X 28" length X 4 high rail. -- Please note that this item requires a Class III 2 inch hitch. 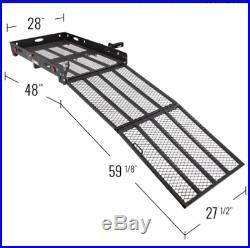 The item "XL LOADING RAMP WHEELCHAIR CARRIERmobility scooter electric trailer hitch SC500" is in sale since Monday, March 25, 2019. This item is in the category "Health & Beauty\Medical & Mobility\Mobility/Walking Equipment\Stairlifts & Elevators". The seller is "jeffco_distribution" and is located in Tallahassee, Florida. This item can be shipped to United States.